WASHINGTON — From the second floor of the Democratic Party’s headquarters near the Capitol, the campaign arm of House Democrats just announced almost double congressional Republicans’ fundraising haul last month — the third month in a row in which they beat their GOP counterparts. But one floor up, where the Democratic National Committee sits, the news was disappointing. The party posted its worst July performance in a decade. Fundraising has been sluggish all year at the DNC, as the Republican National Committee has been eager to point out in press releases and jeers at a recent softball game between the party staffs. The RNC raised $86.5 million so far this year and has $47.1 million in the bank, compared to the DNC’s $41.9 million fundraising haul and $6.9 million in the bank, offset by $3.4 million in debt. But the DNC’s fundraising struggles make it the exception, not the norm, of Democratic groups in the Trump era, many of which have been inundated by donations from the energized liberal base. On one hand, that’s grounds for relief among Democrats, who survey the big picture and conclude their causes and candidates — if not their official national party — will have plenty of money heading into the 2018 midterm elections and beyond. But on the other hand, it underscores that the challenges facing the DNC are endemic to the national party and severe enough to prevent its boat from being lifted in the rising tide of cash. Several Democratic donors, who asked for anonymity to speak candidly, said they’re staying away from the national party, at least for now, because they’re not confident Perez has brought the organization back up to speed and think their money can have a bigger impact elsewhere. Donors have more options than ever now for where to invest their money, Buttigeig said, so it’s not obvious “how much of it needs go through the particular piping of the DNC." The DNC has acknowledged they have rebuilding to do and that the party’s brand has been damaged after years of neglect and controversies, including its hacked emails — which led to top donor's personal information being posted online — and its handling of the presidential primary process last year. Staffing had reached an all-time low when Perez took over about six months ago, and a new finance director and CEO didn’t start until earlier this summer. Still, officials say they’re now on track to raise about what they raised in 2013 and 2015, the last two off-years before an election. Still, some Democrats’ patience is running thin with each new month that brings more underwhelming news, especially while there’s plenty of money finding its way to other Democratic groups. The Democratic Senatorial Campaign Committee outraised Republicans in July, even though they have little hope of flipping the upper chamber. And ActBlue, the online campaign finance clearing house for dozens of Democratic candidates, processed more than $27 million in contributions last month — more than double the amount it handled in July of 2015 and nearly five times as much as it did in July 2013. Others donors, meanwhile, like members of the powerful Democracy Alliance, are turning more attention than ever to the states, where Democrats have been virtually hollowed out. Big donors like Perez, but after spending most of his career removed from politics in the federal bureaucracy, he doesn’t have the years-long relationship with donors predecessors like current Virginia Gov. Terry McAuliffe enjoyed. And the grassroots donors who contribute smaller amounts online may be more interested in giving to individual candidates, with Georgia Democrat Jon Ossoff raising more than any congressional candidate in history. “[W]ithout a positive context, the overall picture one gets from the DNC’s emails is of a directionless, reflexive party that fails to ask Democratic supporters to do more than oppose Republicans,” Michael Whitney, who helped run Sanders’ online fundraising efforts last year, wrote in an essay for Politico. Howard Dean is often considered the gold standard Democratic Party chairman. He took over at a low moment in the party’s history, similar to now, before helping it win back the House and Senate in the 2006 midterms. But he, too, faced fundraising challenges that feel familiar today. This year's fundraising windfall for Democrats has not been uniform. The Republican Governors Association has a solid fundraising advantage over its Democratic counterparts, and the DCCC only just now caught up to its GOP counterpart for the year. But when it comes, it can come big. The ACLU raised over $80 million after Trump’s election, and a bumper crop of new “resistance” groups have sprung up to claim pieces of the seemingly expanded Democratic fundraising pie. 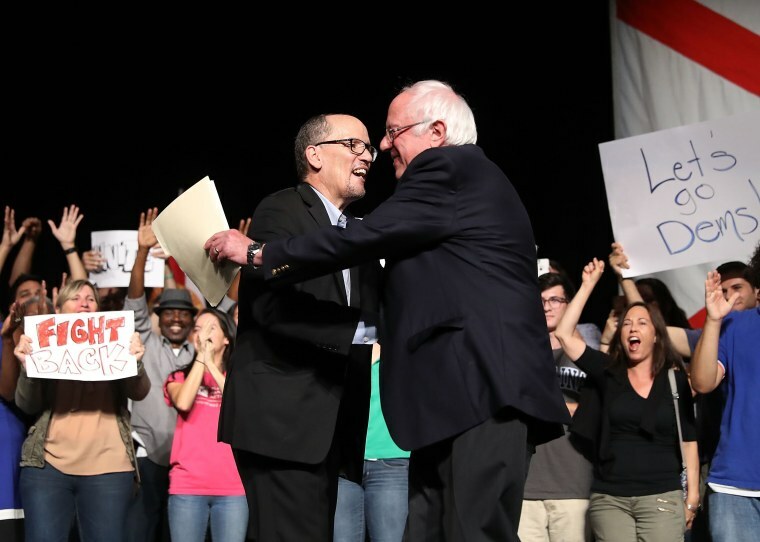 With all the competition, the DNC’s share will likely never be as big as it once was.